“How many of you have a douche bag in your life you want to get rid of?” asked popster Sara Bareilles of the standing-room-only audience at the Granada before launching into “Gonna Get Over You.” Bareilles was in town to headline the annual Kids Helping Kids (KHK) fundraiser. Bareilles, who began her set with “Uncharted,” off her 2010 album Kaleidoscope Heart, was welcomed to the stage by a throng of excited teens. For an hour and a half, the three-time Grammy-nominated singer showed off her enviable vocal skills, singing hits from Heart (“King of Anything,” “Hold My Heart”) and her sophomore record Little Voice (“Many the Miles,” “Love Song”). 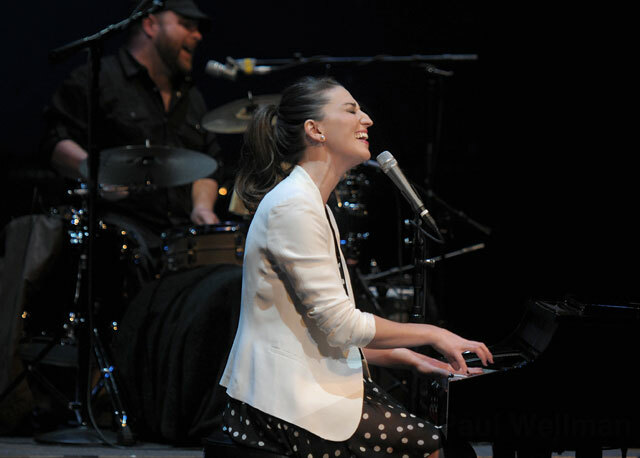 Particularly engaging was her version of Beyonce’s “Single Ladies (Put a Ring on It).” With funny patter and stellar musicianship, Bareilles delivered a delightful performance that had the audience silent during the somber songs and up and dancing during the lively numbers. For the past 10 years, senior students in teacher Jamie DeVries’s AP economics course at San Marcos High School have learned real-world skills via KHK, a nonprofit created by the class to raise money for area charities. Eighteen weeks of planning culminated in this night, which went off without a hitch.